Recently we did a series of articles around an Intel Avoton platform by Supermicro. The Supermicro A1SAi-2750F has an Atom C2750 SoC onboard rated with a 20w TDP, but we found the overall platform took 33w under maximum load. In our review of the Intel Atom C2750 we found that memory performance was slightly below that of Haswell but certainly in the same ballpark using 1600MHz DIMMs. An interesting point was raised: this is a platform where four DIMMs will in fact have a significant impact on power consumption. 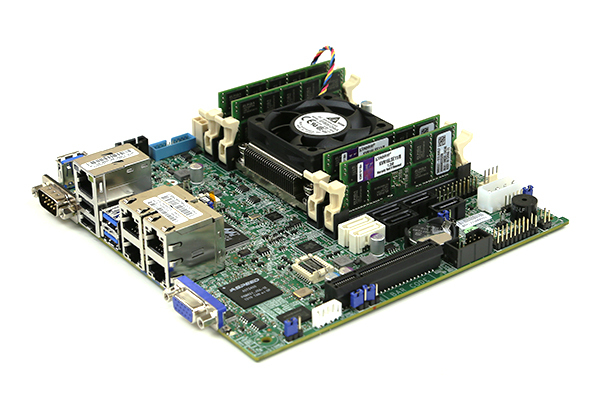 Unlike a typical Intel Xeon E3-1200 server, the Atom platform is meant to run at a lower overall power envelope. As a result, items such as RAM, drives and add-in cards utilize a higher percentage of overall system power. Today we are investigating the impact of low power 1.35v SODIMM memory on the Intel Avoton platform. Note: cooling was provided by our new thermal imaging test platform so it was excluded from these figures. The purpose was to get much closer to the memory impacts. We had to manually set 1.5v operation in order to get a good comparison but this was easy enough to accomplish. While at 1333MHz 1.5v ECC SODIMMs were common, at 1600MHz the industry seems to have moved to 1.35v. Just to validate this approach, we also took the memory and compared it at 1.5v at 1333MHz to ensure we were getting similar figures. This was a good opportunity to test our our Extech 380803 True RMS power analyzer which is the same unit we use for processor reviews. For the first test we utilized only two of the 8GB DIMMs. As one can see, in terms of total power consumption impact, the nominal power savings are similar to what we see in Xeon E3 and desktop applications. 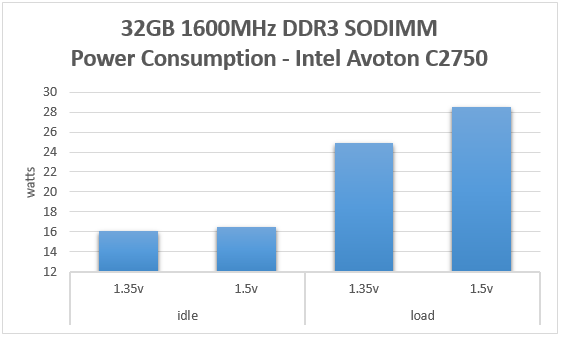 Idle power consumption is relatively similar but under load there is a sub-1w per DIMM difference. With only two DIMMs, the impact on total system power consumption was less than 10% but certainly still noticeable. 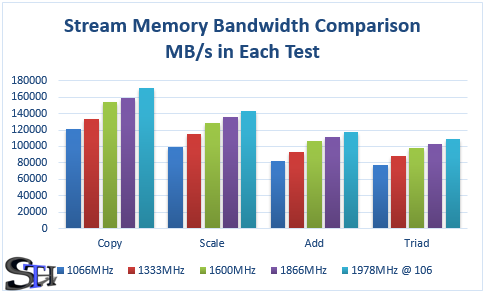 Moving to our 4x 8GB SODIMM test we see a similar pattern. Idle power consumption is very similar with the 1.35v memory edging a slight lead. On the other hand, under load there is a ~10% lower total system power consumption using the low voltage SODIMMs. This is a major benefit. With the Xeon E3 and E5 platforms, moving from 1.5v to 1.35v yields smaller relative power consumption gains so there is an impact at an overall rack level. When looking at our fully loaded system including four gigabit NICs under load and the CPU at full load, power savings from low voltage memory means the difference between 9 servers and 10 servers, fully loaded at 3A at 120v. On these low power platforms, higher density using lower power memory is a very tangible benefit. There are two major factors at work here. First, and most noticeable is the fact that the lower voltage RAM makes a bigger difference in these low power systems. This is simple math at work. In high-end desktop and server systems that can pull well over 400w, saving a few watts per DIMM is a smaller percentage of overall system power. In low-power and high density applications, such as with the new Intel Atom C2750, we can see the overall impact of low voltage memory is much higher. When used in high-density applications such as micro clouds or hyper-scale applications such as HP Moonshot nodes, lower power RAM, such as the Kingston KVR16LSE11/8 modules we used, helps maximize density in a given power and cooling constraint to a much larger degree. Still the question is where to buy the A1SAi-2750F and when will they be widely available. Peter – they are available on Amazon, ebay and elsewhere now at reasonable prices. I assume you mean 1.35V. 2) Please, please, please include numerical data to power consumption charts. As these modules are made of just 16 pieces of 8 Gigabit DDR3 chips, the modules are dual-rank and still have total 16GByte. No special form factor, everything looks standard. Intel recently released a BIOS update for their C2000 Avoton series to support modules with 16GB capacity..
Those 16GByte modules might also work in other systems that require UDIMMs or SO-DIMMs. When looking at the JEDEC DDR3 documentation, a 8 Gigabit DDR3 chip uses the same amount of address lines as a 4 Gigabit chip (A0 to A15). This means there is no hardware-modification required to run the modules. As a logical consequence, such 16GB modules should be working everywhere, in all types of CPUs, as long as the BIOS is programmed correctly to read the module SPD data and set these SPD-values in the memory controller. I test this board with my new memory of 16GB (2x 8GB A1 and B1 slots) 1600MHz 1.35v Kingston KVR16LSE11/8 DDR3. but I can’t boot it. the board report BIOS error which 1 beep. I reset the memory many times, but there is no way to me. my PWS is ENP-7025B. . is there someone help me? As someone already said you should include the numbers when talking about power consumption or at least make them visible when hovering the charts.